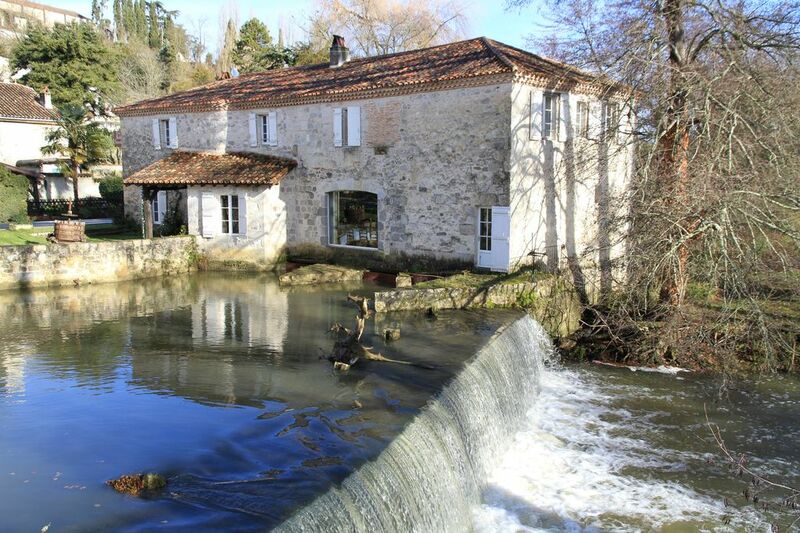 This beautiful mill, perfectly restored (former boutique hotel) is placed on a beautiful river in a pretty village of Albret, in Gascony) 3 km from the Gers and Landes. It has a very large kitchen, equipped with a beautiful cooking Lacanche piano, a very large living room with a large fireplace and a pool table. The first floor has 6 rooms with their own bathroom and their own toilets. A private island hosts a large pool surrounded by a bamboo hedge. As out of touch, this island is a haven of peace and serenity. 4 hours of cleaning per week are provided as well as pool maintenance (included in the rental price. Our home for our stay was this centuries-old water mill located in the tiny village of Poudenas in the Lot-et-Garonne départment. The host at this former Michélin-starred restaurant is the groundbreaking woman chef, now retired, Mme Marie-Claude Gracia-Rey. This gracious and generous "Belle Gasconne" turned the Moulin over to us and it truly felt like home (if your home had a professional kitchen and walk-in refrigerator!). My amateur chef husband was in heaven, even more so when Marie-Claude arrived with gifts like her freshly-made baguette, rice pudding, the abundance of her organic vegetable garden and her recommendations for local markets and restaurants. The house is situated in the village that surrounds the beautiful Chateau de Poudenas. Although photographs show little change since it was a working mill, the bathrooms are modern and there is ample hot water and water pressure. Six good sized bedrooms have crisp cotton sheets and down pillows. One room has a small adjoining sitting room, perfect for our guests with a small baby. A rustic back porch overlooks the river, where we took most of our meals, although a sunny front patio was popular for breakfast and aperitifs. The pool is located within a lush walled garden and has an outdoor shower and lots of loungers. An outdoor kitchen with a sink and fridge has a barbecue and a plancha grill. While there are no grocery shops within the village, the nearest town Mézin (4 km) has several boulangeries and butchers, plus a twice-weekly market that includes an excellent fishmonger on Thursdays. There is a large supermarket in nearby Lavardac (10 km). Marie-Claude's son, Jean-Claude, makes excellent pizza at his restaurant across the street from the Moulin, while his sister Marie-Christine has a café next door where you can have a coffee or a glass of wine and catch up on the local gossip. On Wednesdays and Fridays a small kiosk opens by the river serving rotisserie chicken and salads that can be eaten at picnic tables nearby. Besides eating and cooking, we took long walks on the many paths across the area, picking blackberries as we went. There is a kayak at the house for a gentle journey along the river Gélise. For two stressed out New Yorkers and our extended families this was exactly the getaway that we needed. I can't recommend it highly enough. My parents and I stayed at the moulin for 3 unforgettable nights. The old moulin has been meticulously updated with all modern amenities and is very comfortable. Amazing views from the windows, sound of the river below coming through bedroom windows, the cleanest and most refreshing swimming pool we have ever seen (cleaned daily!) and a true chef's kitchen. The owner, Marie Claude, was a Michelin-starred chef and not only she was a generous and welcoming host, she left home-made jams and other goodies for us to enjoy. They were very responsive to all our inquiries before booking the place and were always there when we needed anything. As a bonus her son runs a delicious pizza cafe just across the street so we were very well taken care of. Cannot recommend enough. The Moulin de la Belle Gascon is a tranquil paradise where we spent a wonderful 2 weeks. Marie-Claude and Christian are the perfect hosts with their attention to detail and consideration to all visitors. The accomodation has plenty of space and bathrooms and has everything one could wish for. The pool is fabulous and the island surprisingly big and well kept. We enjoyed many a game of cricket - both English and French versions! The kitchen was once used by Marie-Claude for the restaurant and you hope that some of her brilliance will rub off on you. The village of Poudenas is so beautiful and like from days gone by where life is much slower. There are plenty of lovely walks nearby in the varied countryside of waterways, forests and fields. Merci beaucoup Marie-Claude et J'espere je vais revenir bientot. Rien à redire sur ce séjour dans ce petit village . Tout d abord un accueil de la part la propriétaire comme on en fait plus. Attentionnée, elle nous a tout bien expliqué sur la maison et les environs. Gel douche de qualité dans les salles de bains , serviette et draps doux qui sentent bon ..
Concernant la maison , c est en effet un lieu atypique , plein de charme . Avc comme surprise la vue Sur la rivière . Un vaste jardin avec piscine ! Bref nous avons passé un super séjour , et espérons vite revenir !! L'accueil des propriétaires a été parfait et le séjour fort agréable. Nous avons séjourné au moulin du vendredi au lundi! Le moulin a beaucoup de charme, chaque chambre a sa salle de bain en suite, la cuisine est une cuisine de professionnelle très bien équipée et la salle de séjour a une vue splendide! Cote jardin, grand espace avec au bout le havre de paix: la piscine, BBQ pour un déjeuner au bord de la piscine! Cote accueil, au top! Mes parents (les 1ers sur place) ont été très bien reçus! At the heart of Gascony, Poudenas (3 km from the Gers) is the country of good food and good living.